LIMA, Jun 29 2012 (IPS) - Peru was certified as compliant with the global standard of the Extractive Industries Transparencies Initiative (EITI) earlier this year. However, its achievements have not satisfied the demands of the local population in mining and oil extraction zones. Most stakeholders agree there is a need for new measures in order for transparency to have an effect on people’s lives. “Instead of just providing transparent information about revenues from natural resources, people really need to know how the resources are distributed and used,” economist Epifanio Baca, a leader of the Citizen Proposal Group (GPC), a member of the international EITI Board and a representative of civil society on the Peruvian EITI National Committee, told IPS. “Accounting for how the income is spent is essential because it has a positive impact on improving people’s quality of life,” he said. But being able to see how much the government is receiving from companies extracting natural resources has not diminished discontent among people living in mining or oil extraction areas, as Humala recognised Tuesday Jun. 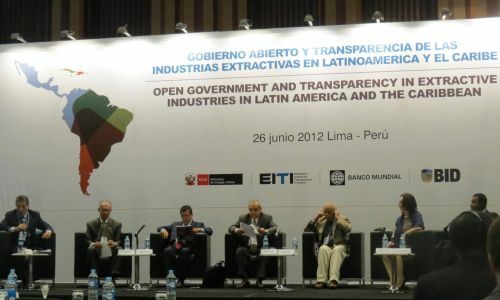 26 at a conference on “Open Government and Transparency in Extractive Industries in Latin America and the Caribbean,” which preceded the EITI board sessions. “It is still not enough to heal the cracks and fissures in our social fabric that date back to the birth of our republic. We need to do more,” Humala said. Most of the conflicts were over social and environmental issues, and they have taken a heavy human toll: close to 200 people were killed and over 2,000 were injured during protests between January 2006 and September 2011, according to reports from the ombudsman’s office. Humala has just given the green light to the Conga project, which is not surprising since the extractive industry accounts for 75 percent of the country’s export earnings, according to Minister for Energy and Mines Jorge Merino. Kurt Burneo, a former Peruvian minister of production, agreed with Baca. “If you want social legitimacy, you have to build trust, and this will not happen without transparency,” he told IPS. “Transparency is important, but we can’t report environmental impact studies in the main square, so that everyone can hear all about them. We can’t carry on suspecting everything and everyone and presuming there is always a deal going on under the table,” Aranda told IPS. “Bolivians are really angry about this,” Hernández told IPS in a break between meetings. Bolivia has not joined EITI, but civil society groups are working to promote transparency. In Colombia, too, conflicts are breaking out in some areas, according to Carlos Andrés Cante, the head of “mining formalisation” – responsible for regulating artisanal mining – in the Ministry of Energy and Mines. However, Colombia is still experiencing a boom in exploration, since most mining projects have not yet reached the production stage. The countries of the region are progressing at different rates, but “increasingly, companies and governments are realising that no advances in this area can be achieved while secrecy and lack of legitimacy persist,” Baca said.